Last week, my family and I went to North Carolina to unplug for a few days. We stopped by Dean and Deluca (an amazing specialty grocery store), where I picked up a can of gourmet French Wild Burgundy Snails. 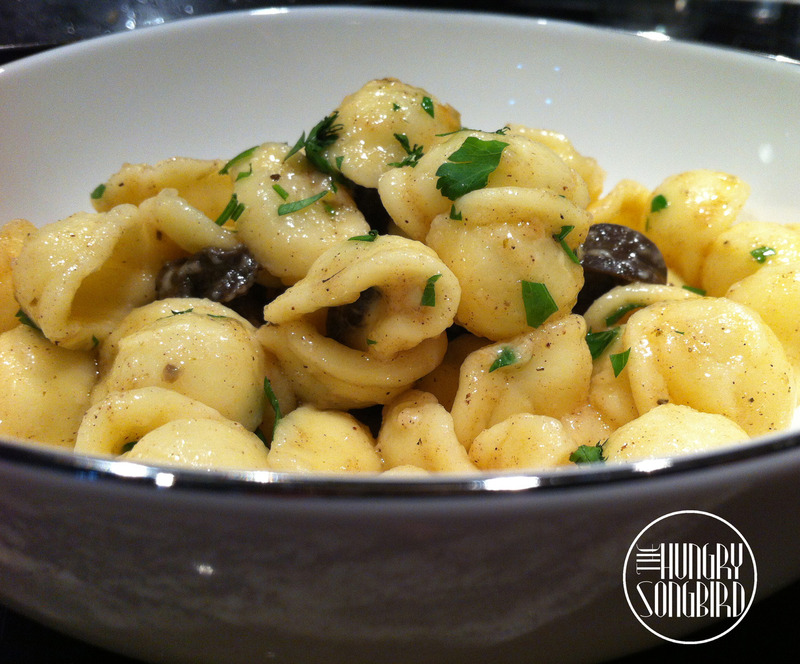 I also found some delicious looking orecchiette pasta, which seemed like the perfect pairing for the snails. While in the mountains of North Carolina, I visited the Ashe County cheese shop and picked up some Ashe County butter, which I used in this recipe. On the last day of our vacation, we went to the West Jefferson, NC, farmer’s market - incredible! A very nice couple, Ron and Suzanne Joyner, of Big Horse Creek Farm, were set up at the farmer’s market. They specialize in Antique and Heirloom Apple Trees, but at the market, they had a booth for their fresh produce, and they had 4 different types of garlic. I bought a few bulbs of each kind, and couldn’t wait to get home to Florida to try them all! From other vendors, I also purchased some beautiful heirloom tomatoes, hot peppers, and a few other goodies. This past weekend was the perfect weekend to experiment in my new kitchen. The day after we returned back to Florida, I spent the entire morning/afternoon chopping, tasting, and experimenting with a bunch of fresh ingredients gathered from our mountain getaway. I made habanero salsa and two different kinds of bruschetta with the juicy, flavorful heirloom tomatoes, but my favorite dish of the weekend was this pasta. Hope you enjoy! Cook orecchiette pasta as directed on package. While pasta is boiling, heat butter in a saucepan over medium-high heat, stirring constantly, for 5 minutes, or until butter has a golden brown color. When butter has desired coloring, add garlic, Herbs de Provence, and snails. Stir to combine, and remove from heat. Strain pasta out of boiling water when finished, and add directly to the browned butter saucepan. Immediately add Parmesan cheese and parsley, and stir to combine all ingredients. Serve in your prettiest bowls, and serve with fresh French bread if desired.